A board at the New York Stock Exchange displays the final numbers. Australian stocks wiped more than $50 billion off the value of the market today after the US House of Representatives rejected a $US700 billion ($860 billion) plan to rescue the financial system. The S&P/ASX 200 Index fell as much as 258.3 points, or 5.4 per cent to 4643. Futures had indicated a fall as much as 7 per cent. Shares in Macquarie Group fell as much as $5.60, or 15 per cent, to $31.60. 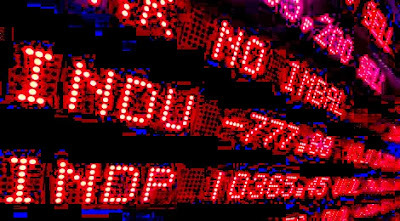 Babcock & Brown shares were the biggest single fall in early trade, losing as much as 35 per cent, or 82.5 cents, to $1.52.5. The US House of Representatives voted down the package overnight, sending Wall Street into a panic and driving the Dow Jones Industrial Average down a record 777.68 points - or 6.98 per cent - wiping approximately $US1.2 trillion off the market value. The S&P/ASX 200 was down 3.35 per cent at 10.10am. Although it's the first-ever trillion-dollar one-day loss, it does not make the top 10 greatest percentage losses. On "Black Monday", October 19, 1987, the Dow dropped by 22.61 per cent. "We are now in touch with all of our counterparts in the United States from the Australian point of view, a British point of view and the Europeans are doing the same," he said. "There's no doubt that events in the United States will probably put further upward pressure on borrowings but we'll just have to wait and see," Mr Swan said today. The House is set to vote today on a $700 billion emergency bailout plan for the financial industry. The proposed legislation was forged during a marathon negotiating session over the weekend between lawmakers from both parties and Treasury Secretary Henry Paulson. The 110-page bill would authorize Paulson to initiate what is likely to become the biggest government bailout in US history, allowing him to spend up to $700 billion to relieve faltering banks and other firms of bad assets backed by home mortgages, which are falling into foreclosure at record rates.